Since falling in love and marrying fifteen years ago, Eileen and Michael Chiarello have been on a mission to change the world—through food. Inspired by his mother’s love and guidance in the kitchen, Michael has focused on building meaningful food experiences for his fans through award-winning restaurants, his sustainably farmed wine label and media platform. Dedicated to championing sustainable food and farming, Eileen’s latest venture, Barnraiser, launched in May 2014 with the goal of providing a simple way for Americans to take charge of their food destiny. From healthy and artisanal foods to community kitchens to educational and organic farms, Barnraiser is a place to meet the people that are making a difference, share their inspirational stories, and fund their successes. Join the Chiarellos for a candid conversation about how love shaped their commitment to flavor, farming and a sustainable food future—and the blood, sweat and tears it took to get where they are today. 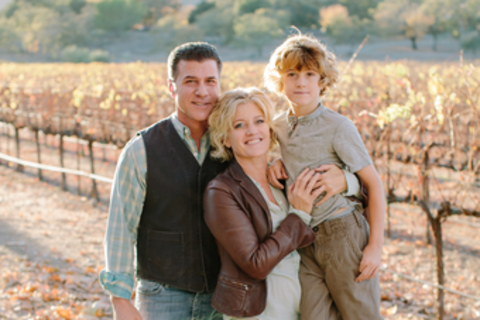 Barnraiser was founded by entrepreneur Eileen Gordon Chiarello, who, with her husband Emmy winning Chef Michael Chiarello, is the proprietor of successful restaurants in the Napa Valley and San Francisco as well as Chiarello Family Vineyards. Eileen’s journey to sustainable food and farming, as well as passion for kids’ education, came from her farming family in Northern California, who are long-time Swiss dairy ranchers and now cheesemakers (Pt. Reyes Original Blue Cheese). An indirect path from Apple's education group to the Napa Valley led to her current obsession with the makers in the clean, good-food movement. She is committed to helping the next generation reclaim power over their food options and nurture an appreciation for the joys of making and growing things. Michael Chiarello is an award-winning chef and owner of the critically acclaimed Bottega restaurant in Napa Valley and Coqueta in San Francisco. In1999, Michael created Chiarello Family Vineyards. These small-production wines are consistently high-scoring and made from the 100 year-old vineyards he tended back to life with sustainable farming practices. Chiarello is the tastemaker behind the NapaStyle retail line. Michael has been on television for a decade as the Emmy-winning host of his own shows on PBS, Food Network, Fine Living, and Cooking Channel. He appeared on Bravo’s Top Chef Masters in 2009, winning second place. Michael appears on national TV morning shows regularly and is the author of nine cookbooks. Michael’s core values include showcasing seasonal, sustainable products, and the artisans who produce them while inspiring friends and family to gather around the table and create meaningful memories of their own.